Featured question comes from Bonnie R.
"The wind blows your hat off and it lands on someone's head...do you wait for them to give it back, politely ask for it, or just grab it back?" After the expected second or two of admiration for the fact your hat landed squarely on the other party's head, you will face two primary options as to how to proceed. 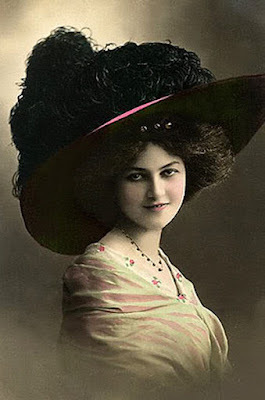 (A) If your hat is feminine in nature and lands on a man, you sweetly mention you have a 'hat just like that' and how fetching it looks on him. You'd be surprised how fast the head covering is returned to you as its rightful owner. (B) When dealing with a woman, this can be tricky. Chances are she will claim 'possession is 9/10ths of the law' and seek to purloin your chapeau, regardless of how graciously you apologize for the windy debacle. If you reach an impasse, simply part ways, and when the offending thief makes a move to leave, 'accidentally' stick your leg out. When she trips, reclaim your property, armed with the 9/10ths regulation should she dare complain.